Maddie Poppe is an American singer and songwriter. She gained a lot of attention for her performance of “The Rainbow Connection” from The Muppet Movie on ABC’s renewed version of American Idol. She has previously auditioned for The Voice back in 2016, but she couldn’t make it to the show. She won the season 16 of American Idol. Maddie Poppe was born on the 5th of December 1997, in Clarksville, Iowa, United States. She’s currently 21 years old. 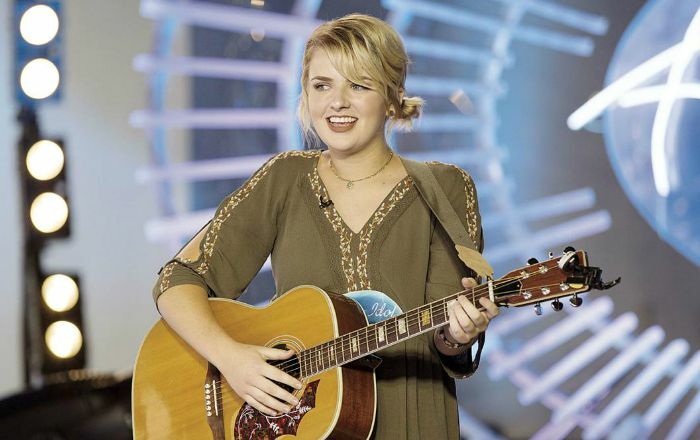 Place of Birth Clarksville, Iowa, U.S.
Maddie Poppe is the daughter of singer and musician Trent Poppe and Tonya Poppe. She has sister named Hannah Poppe. Poppe got herself enrolled at the Iowa Central Community College in 2016 to study graphic design but she later switched to Hawkeye Community College to study digital mass media. The blond beauty has been dating his fellow contestant Caleb Lee Hutchinson since they met on the sets of the show. They revealed that they fall in love with each other behind the scenes and are now couple during the finale. Maddie Poppe released her debut EP titled “Songs From The Basement” in June 2016 on iTunes, which she wrote, recorded and produced. She released a music video for the song “I Like You” in December 2016. She released a single “Going Going Gone” and “Keep On Movin On’ in 2018. She hasn’t been a cast in any feature film till date. Maddie made her first television appearance on ABC’s singing reality show, American Idol in 2018, hosted by Ryan Seacrest with Katy Perry, Luke Bryan, and Lionel Richie as judges. Her appearance on ABC’s revival TV show, American Idol. She began singing at her young age and a huge fan of American Idol. She got acquainted looking at the contestants gaining popularity and fame through the show. Her father is a musician by himself inspired her to make a career in singing. Maddie has gained immense popularity on social media where she has over 16 thousand followers on Twitter, 75 thousand on Instagram and 21 thousand followers on Facebook. She enjoys playing guitar, ukulele and keyboards. She has been performing at local shows and events before her audition for the American Idol. In 2016, she auditioned for “The Voice” and made it to top 95 from over 45,000 contestants. Maddie impressed the judges when she performed “The Bare Necessities” from Disney’s The Jungle Book at “Disney Night” and made it to top 7 on April 29th. In the finale of American Idol, Maddie performed “Landslide”, her original song “Don’t Ever Let Your Children Grow Up, and eventually declared the winner, with Caleb Lee Hutchinson as first runner-up and Gabby Barrett, second runner-up. The Governor of Iowa, Kim Reynolds has declared May 20 as “Maddie Poppe Day” in Iowa. In 2018, she won the People’s Choice Awards for Competition Contestant of 2018.